Welcome to Lenahan Chiropractic! 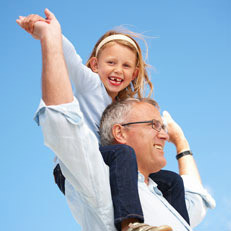 Our fun and family-focused practice is an oasis of healing. With walls painted in soothing colors and music playing, you’ll enjoy coming to visit us! Our open treatment setting fosters friendly interaction among patients. When you come in, we will welcome you, shake your hand and introduce our staff to you. You will be asked to complete a few pages of intake paperwork, followed by a pain diagram on an iPad which transfers into the computer system. Then, you’ll meet with Dr. Lenahan who will take you to the examination room where he will perform a thorough exam and take X-rays. He also will discuss what your expectations should be based on how long you’ve had pain. You’ll then be scheduled for your next visit, which is the report of findings. The first appointment takes 30-45 minutes. When you return, Dr. Lenahan will go over your X-ray findings with you in a detailed report. You will be given a color report which has photos of your analyzed X-rays for you to review once you leave the appointment. After presenting his findings, he will discuss a care plan. Your future visits will be scheduled based on the plan. This appointment takes about 30 minutes. Regular visits only take about 10-15 minutes including a brief wait time. No! You are in complete control, and the level and frequency of treatments are completely up to you. Dr. Lenahan’s goal is to educate patients about why they’re experiencing what they’re experiencing. “I get adjusted every week and will continue to do so for the rest of my life,” he says. He always respects patients’ decisions regarding care though. We understand that you may be on the fence about trying chiropractic. Perhaps you’ve tried conventional medical approaches in the past to find solutions for your pain or condition. Chiropractic is natural, safe and effective. If you’re wondering if it could help you, we invite you to book a free, no-obligation consultation with Dr. Lenahan. You can call (732) 316-4004 or book through our website. Please note that we have a 24-hour cancellation policy so if you can’t make the appointment we kindly ask that you let us know at least a day in advance. One of the ways we educate our patients and the community is through various discussions. Dr. Lenahan covers a range of health-related topics such as weight management, smart ways to engage in fitness without getting hurt, and the gluten-free and paleo lifestyles. We look forward to seeing you soon. Book an appointment today at our South Amboy practice!